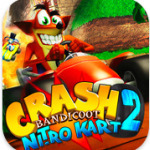 At $9.99 Crash Bandicoot Nitro Kart 2 is a pretty pricey iPhone application. 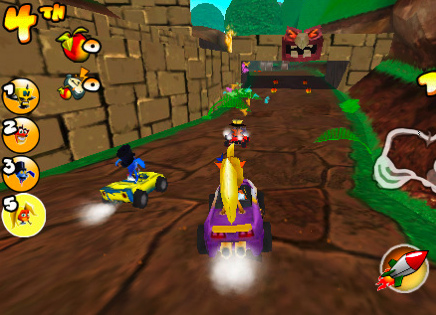 Developed by Activision, the game is the follow-up title to Crash Bandicoot Nitro Kart 3D and again features Crash as well as nine other characters from the Crash Bandicoot series in an all-new racing game. The game has 12 different tracks you can race on, and players are given a multitude of weapons that can be used to give your opponents a hard time. I’ve been a huge fan of the Crash games since its beginnings on the Playstation, and this game lives up to what I’ve come to expect from the series. 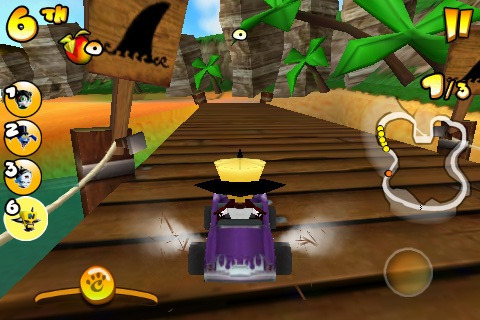 The graphics are great, and the game has a fun and upbeat soundtrack behind it to race to. I had a little trouble getting into the racing game at first on the iPhones small screen (and got a little nauseous in the process), but the application is also compatible with the iPad which should take care of the size issue. 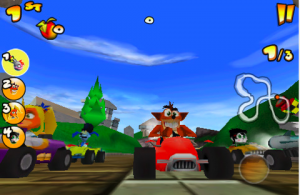 As an ultra-competitive gamer I prefer to play against a real person over a computer any day, and if you happen to have a few friends who have also downloaded Crash then you can complete with up to three of them at a time using the games internet-connection function. It’s a feature which I consider to be one of this titles biggest draw-cards. If you don’t have buddies to play the game online you can also join game rooms and compete with strangers around the world. 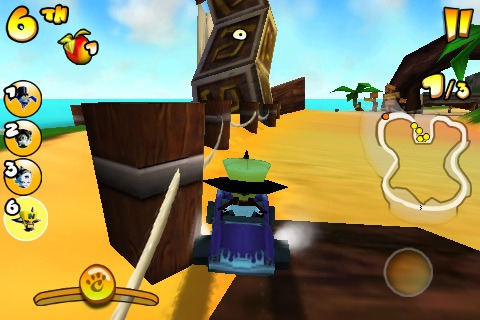 In addition to the multiplayer version of the game there are also a number of other game modes including a cup tournament option where players play three different races back-to-back, an elimination mode where you try to take out your opponents with weapons, a mission mode where you are trying accomplish a certain task, a time-attack mode where you have a certain time limit to compete in, a collector mode, a skill mode, and an arcade mode. All of these different game types are locked when you first start playing Crash except multiplayer, cup, and mission. While $9.99 is a lot to pay for any iPhone game, I think the multiplayer internet-connection option will be enough to keep the game fresh and worthy of the hefty price tag. The way Crash Bandicoot is set up with weapons and the like, the game will be a little different depending on who you’re playing against, so if you’re playing against a seasoned player who knows how to use weapons effectively the game will be much more challenging than against the computer or someone who is just learning to play. Crash Bandicoot Nitro Kart 2 also has enough character and track choices that it can seem like a new experience almost every time you play it, no matter who you’re playing against. If you like Mario Kart, or even racing games in general chances are you are going to love Crash Bandicoot Nitro Kart 2.